Join Downtown Oroville for a Halloween Spooktacular! The Exchange, Copa de Oro, Butte County Wine Company, Casa Veja, The Eagles, and Miner’s Alley have joined forces for a night of fun! Specialty halloween drinks, treats, live music, costume contests and more! It's that time of year again! May 5th is the 8th Annual Salsa Taste Off downtown! From 12-4pm, stroll downtown, stopping into each participating shop, to not only try some amazing salsa, but to also experience all of the amazing local businesses we have in our beautiful historic downtown district! A list of participating stores will be available at Brushstrokes Art Studio! Each store's salsa is homemade and completely unique, varying from sweet mango to spicy habanero! Stroll the historic streets of downtown Oroville this Friday & Saturday from 3-7pm. Enjoy the crisp air & changing colors of Fall! Participating stores will showcase new arrivals & refreshments! Join us in welcoming all the delightful things that the stores downtown have to offer for Fall, like candles, scarves, boots, pumpkin spice lattes, & much more! Hey downtown Oroville… we’re “scarin’ up scarecrows” for y’all during the month of October! Beginning Friday, Oct. 7–Halloween downtown businesses are decorating their windows with one-of-a-kind scarecrows to add to the festivity of the season. So go check out the participating shops and help us find a winner, and see what your downtown has to offer! Email riverfrontdistrict@gmail.com for information on participation! 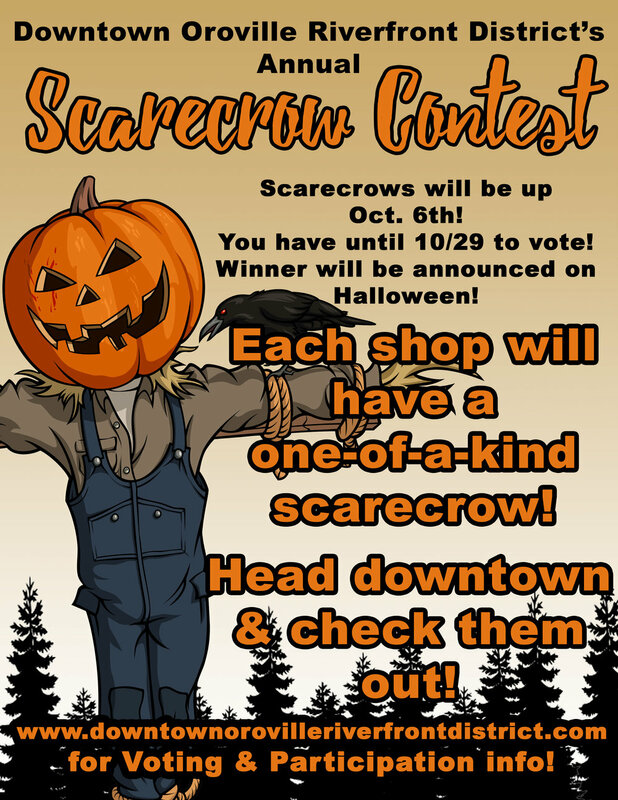 Voting: We’re asking that our downtown Oroville friends vote for your favorite scarecrow through our social media channels! We will stop counting votes on Friday, Oct. 28th. Winner will be announced on Halloween! The decoration that receives the most combined “likes” + “reposts” by the 28th will win. The 4th Annual Mile-Long Yard Sale is upon us! Get ready to head downtown and check out all the neat treasures our town has to offer! Stretching from approximately Mugshots Coffee House to Sank Park, residents and storekeepers alike will be showing off what they have to sell! Begins at 8am and goes until 2pm! Below are a few pics form previous years! We can't wait! It's that time of year again! May 6th is the 7th Annual Salsa Taste Off downtown! From 12-4pm, stroll downtown, stopping into each participating shop, to not only try some amazing salsa, but to also experience all of the amazing local businesses we have in our beautiful historic downtown district! A list of participating stores will be available at Brushstrokes Art Studio! Each store's salsa is homemade and completely unique, varying from sweet mango to spicy habanero! The Mile-Long Yard Sale will be on Montgomery St. from 2110 Salon and Spa to 5th and Montgomery St. Listed above are some places you may like to try while you're in downtown! From getting a cup of coffee before breakfast to sipping on a glass of wine by dinner, Downtown Oroville has everything to offer. While you're shopping in the Yard Sale, check out these awesome secondhand shops or the End-of-the-Summer deals in all of the shops throughout downtown! See you all there bright and early! Mark your calendars! The Annual-Mile Long Yard Sale is almost here! Save up those extra dollars and catch these bargains! It isn't late too sign up to participate, email riverfrontdistrict@gmail.com. See you all there! The 3rd Annual Mile Long Yard Sale is upon us! Its time to gather up all your treasures you're ready to part with and capture a few bucks! Guests from Sacramento to redding will be attending again this year to grab those unique finds. If you are a resident who lives along Montgomery Street and would like to participate please email us at riverfrontdistrict@gmail.com for more information! Furthermore, if you are willing to share your front yard with somebody who does not live in the area, please let us know. It's that time of year again! April 30th is the 6th Annual Salsa Taste Off downtown! From 12-4pm, stroll downtown, stopping into each participating shop, to not only try some amazing salsa, but to also experience all of the amazing local businesses we have in our beautiful historic downtown district! A list of participating stores will be availableanywhere you see a red balloon & signage, so you can start wherever you like! Each store's salsa is homemade and completely unique, varying from sweet mango to spicy habanero! And after you've tasted all of the salsas, you can cast your vote for the best one over at the bus turn around on the corner of Myers and Montgomery! Once you've voted, you'll be entered in for a chance to win one of the awesome prizes from one of the participating stores! So swing by downtown & enjoy! Stroll the historic streets of downtown Oroville this Thursday from 4-7pm & enjoy the crisp air & changing colors of Fall! Participating stores will be having special sales & refreshments! Join us in welcoming all the new things that the stores downtown have to offer for Fall, like candles, scarves, boots, pumpkin spice lattes, & much more! 2nd Annual Mile-Long Montgomery Street Yard Sale! Mug Shots Coffee House & extending all the way down to Sank Park, residents will have their goods out from 8am-2pm & businesses along the route will have their goods out from 10am-2pm! There will be all kinds of treasures to be found & shops to discover! Grab a latte at one of our local coffee shops & make your way down the road! And after you've conquered the sale, swing by one of the local eateries downtown & grab a bite to eat! Farmers Market will also be going on in the Municipal parking lot from 7am-12pm! Swing by downtown to enjoy an awesome 4th of July party this friday, July 3rd, from 4:00-7:00pm! -From 4:00-7:00pm, Alberta Tracy, the Lady of Butte County, will give history talks down Montgomery Street! -At 4:30pm, there will be an adult pie eating contest next to Mary Lake-Thompson Ltd., at the northeast corner of Montgomery & Huntoon! We have 12 available entries so call either Liberty Candy (530) 534-5288 or Kusel's Big Store (530) 693-4030 for more information! -Sidewalk chalk art being draw from 4:00-7:00pm! -Ice cold lemonade in front of Gray Nurse, only $1 a cup! -Live Music by Tyler from 4:00-7:00pm in front of Red Fly Clothing! -And spin the Wheel of Fortune for a chance to win several prizes from local businesses! Wheel will be at the center of the block near Ruby's Boutique! Keep in mind that our 2nd Annual Mile-Long Montgomery Street Yard Sale is coming up this September! Start thinking about all of things in your house that you would like to get rid of & make some money off of! If you don't have a house/yard on Montgomery Street, you can still be included in this event! Give us a call at 530-693-4030 between the hours of 10-4pm & we'll coordinate with you to see if we can fit you into one of the larger yards on Montgomery Street! 5th Annual Salsa Taste Off! It's that time of year again! This upcoming weekend is the 5th Annual Salsa Taste Off downtown! This Saturday, May 2nd, from 12-4pm, stroll downtown, stopping into each participating shop, to not only try some amazing salsa, but to also experience all of the amazing local businesses we have in our beautiful historic downtown district! A list of participating stores will be available anywhere you see a red balloon & signage, so you can start wherever you like! Each store's salsa is homemade and completely unique, varying from sweet mango to spicy habanero! And after you've tasted all of the salsas, you can cast your vote for the best one over at the bus turn around on the corner of Myers and Montgomery! Once you've voted, you'll be entered to win one of the awesome prizes from one of the participating stores! So swing by downtown & enjoy! This upcoming Thursday, please join us in welcoming the new wine season! Enjoy a magnificent roasted tenderloin dinner & perfectly paired wine from Quilici winery, as well as discover all of the local wineries & vineyards from our region that will be represented there! The event will take place at 1359 Huntoon Street, at Gray Nurse Hardware. Our no-host happy hour, catered by JB's beverage & bar service, will begin at 5:30pm & dinner will served at 6.00pm! Live music will begin at 6:00pm as well. Tickets are $25 per person & will be available at most any Riverfront District business. If you have any questions, drop us an email at riverfrontdistrict@gmail.com! Here on the Riverfront District, we'll be celebrating Halloween a little early! This Third Thursday, October 16th, take the afternoon to stroll downtown & embrace your inner child! We'll be having some sweet sales all day & refreshments from 3:00-6:00pm! No tricks, just treats! This Labor Day Weekend, SATURDAY ONLY, August 30th, Downtown Oroville's Riverfront District will be hosting a MILE-LONG Community Yard Sale on Montgomery Street! Starting from Mug Shots Coffee House & extending all the way down to 5th Avenue, residents will have their goods out from 8am-2pm & businesses along the route will have their goods out from 9am-2pm! There will be all kinds of treasures to be found & shops to discover! Grab a latte at one of our local coffee shops & make your way down the road! And after you've conquered the sale, swing by one of the local eateries downtown & grab a bite to eat! Farmers Market will also be going on in the Municipal parking lot from 7am-12pm! We will keep you posted on updates about participating residents & businesses! Jon Shult from the Broken Color Art Gallery at 1360 Montgomery Street will be celebrating his 10th Anniversary as a business in Oroville this year! He is just one of the business owners & residents that will be participating in this year's Mile-Long Community Yard Sale! He will have normal yard sale items in his yard as well as some art supplies, hardware, prints & cards of his paintings! Guests may also peek into his gallery where he has over 100 paintings, prints & illustrations on display & for sale! He will also have information about the art/cartooning classes he teaches for the Feather River Parks & Recreation district, & will be giving away free cartoon samples! Here are just a few of his pieces! Merchants in historic downtown Oroville are gearing up for their monthly installment of Senior Discount Day. The monthly shopping promotion is held on the first Tuesday of each month, which means senior citizens 65 and over will receive 10% off * at participating stores. Seniors can also enjoy food and beverage specials at select coffee shops & restaurants. This is a great opportunity to come downtown and support small businesses and shop Oroville first. A variety of downtown shops participate in the Senior Discount Day. A list of participating merchants is below. * Some restrictions may apply. Please inquire with each business for details.